Early in the morning of the 14th it was cool enough for a safe takeoff from the 15,000 ft runway at Windhoek International Airport, so I taxied out and departed. Only ten minutes into the flight I had a minor, nuisance-type mechanical failure. The elevator trim switch on the pilot's yoke became intermittent, which in turn made the autopilot occasionally decide to poop out and shut off. While not a problem of any real significance on a domestic flight, the potential failure of my autopilot on any of the upcoming 14 hour transoceanic legs back to the States made for a very unpleasant thought. Hand flying an aircraft for any lengthy period can be tiring, and this would especially be the case with an overloaded, unstable, ferry loaded Mooney. I had a decision to make. Press on and hope the intermittent switch would behave itself? Land right away at Windhoek's smaller general aviation field right over the nose where light plane maintenance people are known to be available? I knew that stopping now could mean substantial delays, as the small airport ahead had a short 5,000 ft runway, and by the time the problem would be fixed, I'd have to stay over another night in Windhoek to await cooler morning temperatures to safely get off the ground again. 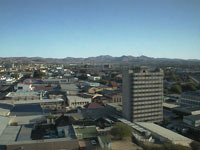 The city of Windhoek is situated about 5,500 ft above sea level. Put in pilot terms, this means that a normally aspirated (i.e., non-turbocharged) airplane engine, like the one on my Mooney, would have to takeoff with only about 75% of its power available, rather than the 100% power obtainable with a sea level takeoff. Warm temperatures exacerbate this effect, while cooler ones diminish it. Still, after a couple of minutes mulling over the dilemma I elected to put in at Eros Airport, the smaller Windhoek field, and get the problem fixed. True to their reputation, the maintenance folks there did a magnificent job, and within three hours I was all set to go again. However, as expected, the soaring air temperature had pushed the field density altitude up to 8,400 ft, far too high for me to attempt a takeoff on a 5,000 ft runway surrounded by hills. Thus, I spent another night in Windhoek, again awaiting the cooler morning air for a launch to Walvis Bay. 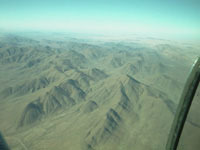 Namibia, the next stop in Africa, is mostly composed of desert and sandy mountain ranges. Here's a look at the terrain of that country from 10,000 ft.
My first stop in Namibia was in its capital city, Windhoek, for fuel and a night's rest. So few airline flights go there, though, that when I landed I found that there would be no taxi's available for several hours, and the airport is a 45 minute drive from the city. Taking pity on me, Avis Rent A Car station manager Gail De Silva is shown here giving me a ride to town in her own car when she got off work just a few minutes after I arrived. No charge! 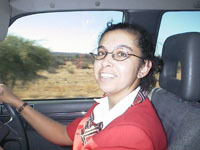 She also generously arranged for an Avis employee to greet me when I landed two days later in Walvis Bay, another remotely located airport, and drive me to my hotel there as well. Way to go, Gail and Avis! Incidentally, I didn't simply rent a car myself, as Namibia drives on the left side of the road, like in England, and I've never done that before. Without a lot of experience, drivers have been known to get into serious accidents by abruptly attempting this shift in driving rules. Besides, I had no desire to learn the penalty for some inadvertant traffic violation in an unfamiliar African country. Downtown Windhoek, Namibia as seen from my hotel room. Although a city of only modest size, Windhoek is remarkably modern. It originated in the nineteenth century as a German settlement, and German and Afrikaans are still the predominant languages spoken by the locals. The aircraft maintenance facilities in some Third World countries are remarkably impressive. 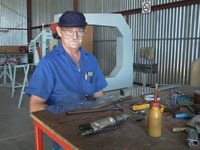 Located thousands of miles and numerous time zones away from sources of new parts and factory advice, these folks have learned over the years how to fend for themselves, and the work they do is excellent by any standards. 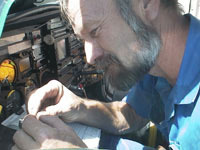 Here Peter Hartmann of Aviation Centre in Windhoek, Namibia is rebuilding my defective yoke-mounted elevator trim switch. It was again working perfectly after just 3 hours of clockmaker-like work by Peter. In the States, I would have had to replace the entire switch module, probably waiting a couple of weeks for the part and paying a price of about $750. The invoice I paid with US dollars in Namibia was less than one-third of that amount, and that included a new aircraft battery that I needed as well! Along the same lines, this craftsman is one of a dying breed. Now a Windhoek based Namibian, but of Dutch descent, Gert Du Preez is a master with metal. He can build a Cessna, Piper, or Mooney from the ground up, starting with nothing but the registration plate from an old wreck, which serves as a legal platform upon which he can fabricate a better than new airplane. I found his work to be nothing less than amazing! On top of that, Gert's prices for this work were far less than the cost of factory new parts. The world will suffer a serious loss when he retires in two years. 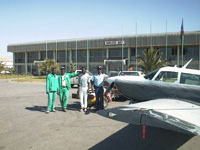 The refueling team and landing fee collector that greeted me when I landed in Walvis Bay, Namibia. I flew here because it is a sea level airport located on the western shore of the African continent. I couldn't takeoff from anywhere in Zimbabwe or from Windhoek, Namibia with the ferry tanks filled, as those airports (like Denver) are located at high elevations, where the engine on the Mooney couldn't develop sufficient thrust for a safe takeoff at heavy weights. This stop, then, provided a comfortable launching site for the long flight up the West coast of Africa to Gabon. Well, it had to happen. The great haircut I got back in Brisbane had given way to an overgrown jungle, and it was by now clear that I had to get another trim before I could make it back home. But where? 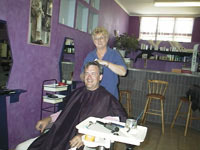 Well, even in Walvis Bay, Namibia (population 32,000) one can get a very fine hair styling job! 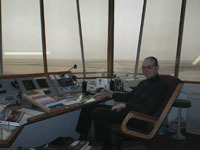 View from inside the air traffic control tower cab in Walvis Bay, Namibia. This controller was very helpful, advising me of the unpublished fact that Walvis Bay's runway sloped downward slightly in the westward direction, and therefore recommending that I launch my overloaded flying machine in that direction to take advantage of gravitational help on takeoff.